In the 55 years that I have attended Los Angeles Philharmonic concerts I cannot count the number of composers who have conducted the orchestra. However, only a few have carved major careers in both disciplines. Two of those were LAPO Music Directors: André Previn and Esa-Pekka Salonen. Two others in that multiple-category were Leonard Bernstein and Pierre Boulez. Over the weekend more than 50,000 people jammed Hollywood Bowl for three concerts conducted (in part) by another of those multiple-category icons: John Williams pictured above). He’s never held an official position, either conducting or composing, with the Phil but he long ago might as well have been named Principal Conductor of Movie Music Programs at the venerable Cahuenga Pass amphitheatre since, as he told the capacity crowd last night, this is his 38th year of conducting at the Bowl. David Newman — who is himself both a composer and conductor — told the audience early on that he believes Williams introduced the concept of leading an orchestra accompanying movie clips, and so he did last night. At age 84, Williams was more than willing to share the podium with Newman, who — Williams told us — he met when Newman was a toddler and Williams was playing in the 20th Century Fox orchestra for the 1957 movie version of South Pacific (Newman’s father, Alfred, was the studio’s music director and a formidable composer in his own right). Newman and the orchestra opened last night with a suite from Alan Silvestri’s score to Forest Gump, which accompanied a montage of clips saluting Paramount Pictures’ 114-year history. Some of the remaining numbers — a suite from Franz Waxman’s score for Sunset Boulevard and Nino Rota’s score to The Godfather and Godfather II — were accompanied by montage clips from their respective films. Others — Williams’ theme from Sabrina and “The Wild Ride” from Bernard Hermann’s score for North by Northwest — were performed simply as music. Newman’s commentary was intelligent but sounded somewhat frantic in delivery, especially considering that this was the third show of the weekend. It made me appreciate anew how good conductors such as Rachael Worby, John Mauceri and Bramwell Tovey are at this skill. The formal first half (Newman and the orchestra encored with the Mission Impossible theme music) ended with the opening sequence from Star Trek: Into Darkness, with Newman leading the orchestra as it accompanied the action on screen. During the intermission, I heard one teenager sum things up when he said, “The Star Trek was dorky but I thought North by Northwest was cool.” The kid’s got the makings of a critic! Williams led his own music the second half of the concert. I was struck by how much more at ease and fluid he seems as a conductor from when I first remember seeing him on the podium. He still uses a score for everything but he was relaxed and seemed to thoroughly enjoy himself, even adopting a few of Gustavo Dudamel’s sly mannerisms to keep things moving forward smartly. About a quarter of the exuberant 17,000+ attendees came armed with light sabers, a phenomenon that Williams remarked is unique to the Bowl (my box mate brought a bottle of “Lord Vader” beer, instead). After Williams and the orchestra teased the audience by playing “Flight to Neverland” from Williams’ score for Hook and a suite from The BFG, it was time for music from the Star Wars movies, starting with the latest incarnation, The Force Awakens, and continuing with music from the original trio of George Lucas-created films. Film montages accompanied some — but not all — of the music, all of which the orchestra played with its customary panache. As he introduced various segments, Williams told the story of how, in 1977 while seeing rough cuts of the original Star Wars movie, he assumed that Luke Skywalker and Princess Leia would eventually become lovers and so wrote the “Princess Leia” theme as sensuous love music, not realizing until later that they were, in fact, brother and sister. “Not exactly appropriate music,” he noted wryly. The “Throne Room & Finale” from Star Wars: A New Hope had light sabers waving everywhere in time to the music, a truly amazing visual. Williams and the orchestra encored with the themes from Harry Potter and Superman and the “Flying Music” from E.T. : The Extra-Terrestrial (heading home, many of us longed for those flying machines to leave the parking lots). Although I saw and heard Bernstein conduct many times, rarely did he lead his own music. Ditto for Previn. With Salonen I’ve gotten to experience him conduct several of his own pieces. 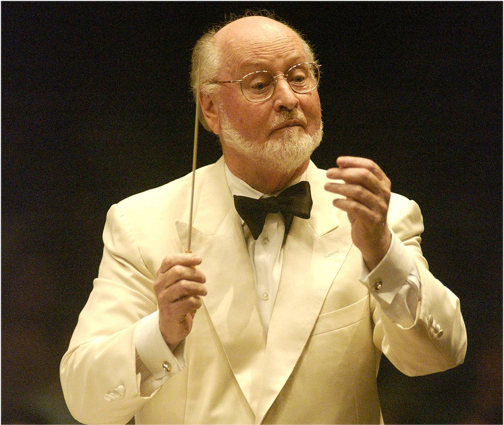 For 38 years John Williams conducting his movie music has been a part of our lives in Southern California and it never gets old. Good thinking, Nick. At age 56 the Roswell, NM native (pictured left) is at the peak of her career, which includes roles ranging from Monteverdi to Jake Hegge’s Dead Man Walking. She brought to the Bowl last night arias from two Handel operas and sang them magnificently. In the process she managed to make the cavernous Bowl seem like an intimate recital hall. It’s a shame more people didn’t attend. Graham looked as gorgeous as she sang, wearing a multi-colored robe over a simple black dress in the first half when she sang Scherza infida and Dopo notte from Ariodante. Post intermission she switched to a stunning, shimmering turquoise robe and sang Ombra a mai fù and Se Bramate from Xerxes. Throughout the performances, she held the audience spellbound with her amazing runs and melismas, but she did more than simply sing the parts. In the first half she was the title character, displaying a full range of emotions from despair to laughter; in the second half, she laid into Se Bramate with all the anger she could bring to a non-staged performance. However, for this listener, the highlight was the amazing pianissimo she dared to float at the beginning of Ombra a mai fù, the note hanging in the night air as clearly as if she was singing in Walt Disney Concert Hall. McGegan and the Los Angeles Philharmonic accompanied Graham sensitively although — truth be told — she was, in every sense, the central focus. The ebullient McGegan surrounded Graham with several well-known Handel works, taking full advantage of 79 voices of the Los Angeles Master Chorale in the opening work, Zadok the Priest (aka Celebration Anthem No. 1). The Chorale sang superbly and the amplification was so much on the singers as to virtually obliterate the orchestra, which was just fine by me. The first half closed with Awake the Trumpet’s Lofty Sound from Samson, which found the chorus playing off beautifully against Principal Trumpet Thomas Hooten, although the work was so short that the audience didn’t realize it was over until McGegan turned around and indicated that it was okay to clap, which they did. McGegan and the orchestra offered a spritely performance of The Arrival of the Queen of Sheba from Solomon to bring Graham onstage for her first-half numbers. Post intermission, McGegan used breathless tempos in the Suite No 2 from Water Music and Music from the Royal Fireworks, which the orchestra handled with its customary aplomb. In past years, actual fireworks have accompanied that latter piece but, given the high fire danger and with news of the I-15 fire on people’s minds, it was probably just as well that the Phil elected to eschew the pyrotechnics. No need to repeat the premiere performance on April 27, 1749 when a 100-foot-high and 400-foot long tower burst into flames, causing the crowd to panic with, reportedly, at least two people killed. Instead, McGegan closed the evening by leading the orchestra and Master Chorale in a lightning-fast rendition of the chorus, Hallelujah, from Messiah. Only ensembles as great as the Phil and Master Chorale could have handled these tempos, but McGegan added some nice dynamic layering to the performance just to keep everyone on their toes. Temperatures cooled off last night but the music making remained hot as Gustavo Dudamel began his final week this summer at Hollywood Bowl. A large, boisterous crowd was joined by at least one malodorous skunk in the venerable Cahuenga Pass amphiteatre. Several aerial intrusions — more than usual this summer — flew into the Bowl’s airspace (most, fortunately, at times when the orchestra was playing loudly). PBS was on hand to tape the proceedings for a future broadcast. The Bowl shell was bathed in rose and peach hues with alternating blue and green backgrounds. Nearly all of the first-chair players were back on stage. This was not your normal Bowl evening. For the first of three programs this week infused by dance, Dudamel chose four works with the tango at their heart. The opening and closing works were by the Godfather of the Tango, Astor Piazzolla. In between were four familiar dance episodes from Estancia by Alberto Ginestera and the world premiere of a Concerto Guitar, subtitled Concierto de la Amistad (Concerto of Friendship) by Piazzolla’s friend and compatriot, Lalo Schifrin. Alternating touching lyricism with moments of playfulness, the 30-minute long, three-movement works is an important addition to the guitar-concerto literature, among other things, giving orchestras something besides the “standard” works by Joaquín Rodrigo to program when they’re looking for guitar music. Romero — who turns age 70 in two weeks and was wearing a highly colorful shirt — was riveted to the score but delivered a gentle, soulful rendition of the piece, aided by Dudamel and the Phil, with standout solo work from Principal Harp Lou Anne Neill and Carolyn Hove on English horn. Schifrin was on hand to join Romero and Dudamel with joyful hugs and to receive thunderous applause from the audience. Lush strings began the evening opening Piazzolla’s Tangazo, with the full orchestra — including Principal Flute Denis Bouriakov, Oboeist Marion Arthur Kuszyk and Principal Horn Andrew Bain — beautifully filling in the texture later on. Ginestera’s Four Dances from Estancia — a Phil and Dudamel speciality since the Venezuelan-born maestro took over the Phil — provided conductor and ensemble chances strut their collective stuff. The evening concluded La muerte del Angel, from a series of “Angel” pieces written by Piazolla in the 1960s. This piece was written as an elegy to the composer’s father, who died in a bicycle accident in Argentina in 1959. Seth Asarnow on the bandoneon (“button accordion”) and several dancers from Tango Buenos Aires joined Dudamel and the Phil in a spirited rendition of this four-movement work, rounding out the evening on an emphatic high note. • Ben Gernon, who was a Dudamel Fellow during the 2013-2014 season and won the prestigious Nestlé and Salzburg Festival’s Young Conductor Award in 2013, returns to lead the Phil tomorrow night. Continuing the week’s dance theme, the post-intermission work will be Stravinsky’s The Firebird, when Janni Younge and Jay Prather will use giant-sized puppets to reimagine the original 1910 ballet. Among other things, the setting has been shifted to contemporary South Africa and the production uses African dance forms. 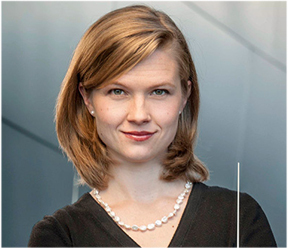 NOTE: This column has been revised to include date changes and a link to an article on Solea Pfeiffer. The July 14 and 19 programs will see Dudamel leading a work that is embedded in his DNA: Leonard Bernstein’s West Side Story. 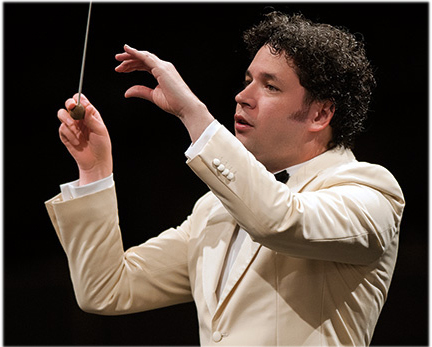 It was with the “Mambo” portion of “WSS” that Dudamel burst onto the scene with his Simón Bolivár Youth Orchestra of Venezuela at the Lucerne Festival and the London Proms in 2007 (LINK). What makes the Bowl classical season important? For many of us, Hollywood Bowl was among our first exposures to classical music. I remember being mesmerized by the gigantic Bowl with its thousands and thousands of seats under a canopy of stars (if they were visible through the smog) and for one of the first times hearing the L.A. Phil playing glorious music live. Although each year I kvetch about the orchestra’s management not being more aggressive in making more seats in the upper tiers available at lower prices, you can buy seats at $8 and $12 for some concerts, which is cheaper than attending a movie these days. Moreover, the enhanced sound system and gigantic digital monitors make the experience far better than when I was a kid a half century ago. There’s nothing quite like it anywhere. Information on the entire summer schedule is HERE.